WASHINGTON — Scientists tag sharks to see where they roam in the high seas, but until now they couldn’t track the seas’ biggest eater: Humans. By using ships’ own emergency beacons, researchers got the first comprehensive snapshot of industrial fishing’s impacts around the globe. And it’s huge — bigger than scientists thought, according to a new study. Large-scale commercial fishing covers more than 55 percent of the oceans with the world’s fishing fleet traveling more than 285 million miles a year — three times the distance between Earth and the sun, according to research in the Feb. 22 journal Science. 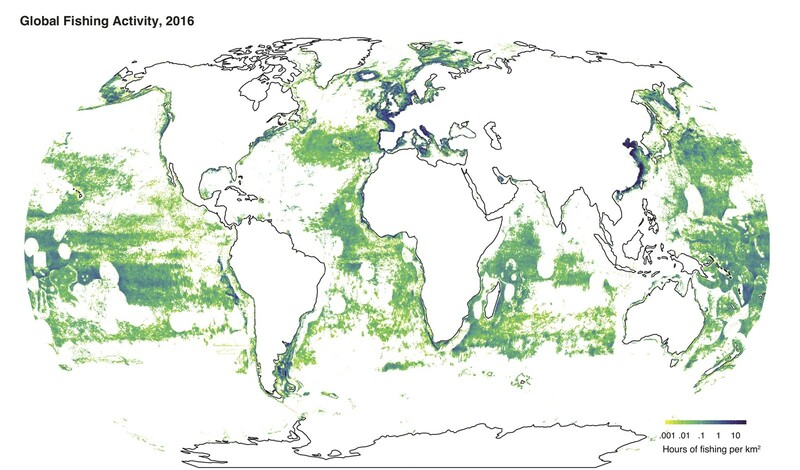 The fishing patterns were gleaned from 22 billion automated ship safety signals beamed to satellites. Before this, scientists had to rely on a sampling of ships’ logs and observations, which were spotty. Ships are obeying no-fishing zones and times, although they hover at the edges of marine-protected areas. “The maps of global fishing in this report are sobering,” Douglas McCauley, a University of California, Santa Barbara marine biologist who wasn’t part of the study, said in an email. China dominates global fishing. Of the 40 million hours that large ships fished in 2016, 17 million hours were by boats under a Chinese flag, according to another study co-author, Stanford marine biologist Barbara Block. “No longer is the ocean — especially the high seas — out of sight, out of mind. No longer should it be the ‘wild, wild wet.’?” former National Oceanic and Atmospheric Administration chief Jane Lubchenco said in an email. She was not part of the study. From 2012 to 2016, the research team collected boat location signals. New laws require ships of a certain size to carry automated identification systems that every few seconds beam their location to satellites as a safety measure. Scientists then used artificial learning computer programs to translate that information to show where boats were fishing, how they were moving, what they were likely fishing for and how they caught them. Monitors then checked the data against log books from some ships and they matched, Worm said. It also shows that in the high seas, there’s a heavy use of longline fishing, which generally catches more of the top predators like tuna and sharks. Researchers said these findings could be used to better protect the oceans and keep fisheries alive.